Musicians, or fans of Mega Man Legends music in general, take notice! 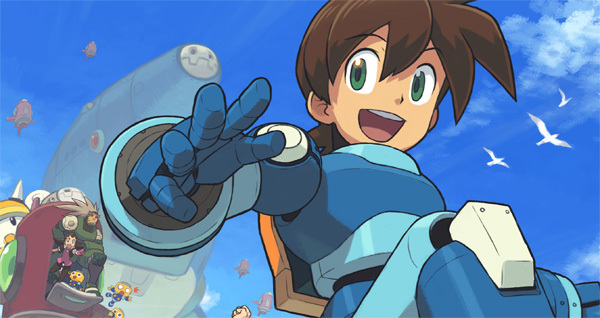 Get Me Off the Moon (aka 100,000 Strong For Mega Man Legends 3) has announced the Mega Man Legends 3 "concept album" project. It's nothing short of ambitious and everyone's invited to participate. Your task is this: create the sort of music you think might have been in Mega Man Legends 3, had it actually come out. We've heard a few bits and pieces of Legends 3's music in trailers, but today we're grabbing the bull by the horns and making our own! All the details after the break. "Greetings to you, passionate Legends enthusiasts, Mega Man fans in general, and other interested parties. I'm going to introduce you to a project that's both unique and challenging; it is both because nothing quite like this has ever been tried for a Mega Man game to the best of my knowledge. The telltale sign of a good game is one that you keep playing even after you turn off the machine. You may be finished playing the game, for the time, but it continues to run in your mind. You wonder about its world and its characters, questions left unanswered. You talk to your friends about it, discussing the various elements of its mythos. You might even go so far as to make a website about it, or a comic, or your own story with your own characters - pretty crazy, huh? Some games just have such fascinating worlds, they grip you that way. Mega Man Legends is undoubtedly one of those games. Its wonder, its mysteries and its charm have kept its fans actively interested in the series, even despite a whole decade without a new chapter. For this project, I will ask you to harness that sense of wonder and awe. You can do a lot of things with imagination, but what we aim for today is this: a Mega Man Legends 3 concept album. Yes, at its heart, this will be an endeavor about making music. But it will also be a lot more than that. It will be a coalescence of music, art and ideas. In truth, the scope of this project is broad, so I will try to be as clear cut as I can. The purpose of this project is to create an album of music that represents what Legends 3 could have been, as well as flesh out the unseen world of Legends. This is not a remix project; we will be primarily looking for original tracks. Any kind of music, any kind of theme, any kind of style. Unlike past Neo Devroom events, this is not a contest. However, we will be looking forward to some amazing music. All in all, this will be a creative collaborative effort. The forums will be utilized for discussions about speculation on Legends 3 and its world, which will give rise to artwork representing those discussions. And in turn, that brainstorming will hopefully lead to music. It's all meant to be a broad, symbiotic sort of process, and frankly I can't be sure how it will work. But what I do know is, if the people who get involved put their hearts and minds into it, something amazing will be created. What do I mean by imagining then world of Legends 3? Well to start with, imagining what the game would have been about; its characters, events, locations, and so forth. But it goes beyond that as well. Who are the kinds of people who inhabit the world of Legends? What are their customs; their hopes and dreams? What kind of mysteries are buried under the remaining lands, and floating far above the skies? What mysteries? What treasures? What terrors? Ultimately we will be ushering in music and artwork that gives form to these thoughts, and what their answers could be. You will listen to this music, and you will be able to envision the world it describes. That is my wish, anyway. For now, there are a lot of uncertainties that remain to be answered. The scope of this project, as well as how long it will run, are all up in the air. We are looking to you for that. Right now, we aim to compile the music and artwork into a digital album that will be available on Bandcamp. And while this is a completely voluntary undertaking, we do hope to find some small way to compensate those who help make it. From here on, let's see how this goes. I beseech you all to spread the world, and give it your best effort. The wonder and magic of Legends has always existed foremost inside of you. Let it out." And that's that. If this sounds like something right up your alley, stay tuned for further details! Nothing short of ambitious, eh? WELL I'M NOTHING SHORT OF MILDLY INTERESTED! As I've posted elsewhere, I already have two Legends 3 concepts in the works. This is a great way to complete them, if this idea goes into full swing, that is. Aww yeeeeeah, I'm definitely sending in music! I've been lax on creating new music for awhile and I need inspiration. I'm looking forward to this.